A trip across Norfolk this Sunday to catch another game of football from the FA Women's Cup. A local derby match too! 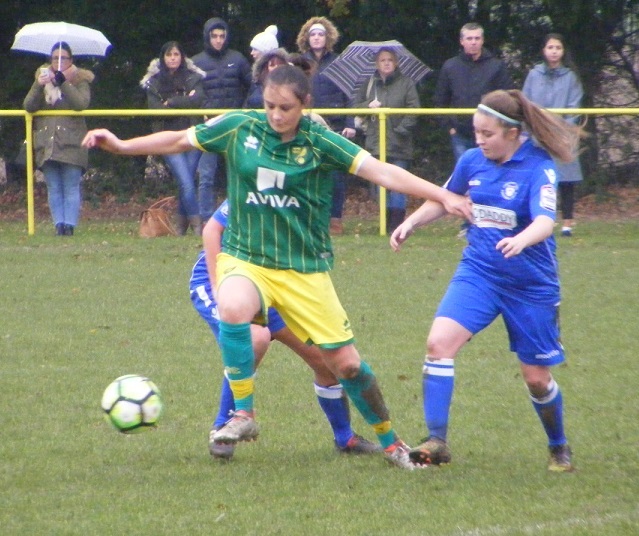 Postponed from last Sunday due to a water-logged pitch the game survived the overnight rain deposited across the South East by Storm Angus, the venue Plantation Park home of Norwich City Ladies hosting Suffolk rivals Lowestoft Town Ladies in 4th Round Qualifying. Both sides playing for a place in the 1st Round Proper of the competition the draw already made know their opponents, a home tie against fellow South East Division One side AFC Wimbledon Ladies one of the early pacesetters in the league. Both sides entering the FA Women's Cup in the previous round. The venue for today's game Plantation Park was touch and go as to whether it would survive the over night storm, hard work in the morning by Norwich Cty Ladies and Norwich United inspecting the ground early saw it go ahead so long as there wasn't anymore heavy rain, leaden skies above didn't look promising but nevertheless the match was on for a 1pm kick-off, extra-time and penalties if required to settle the tie today. Is a small covered stand upon one side of the ground for spectators to watch keep out of the rain. 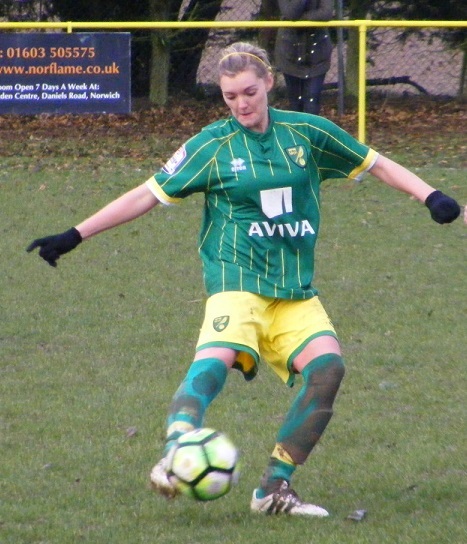 Norwich City Ladies starting XI - Fiona Coombes, Erin Wilson, Rebecca Russell, Bryony Rapley, Kate Parsons (C), Jodie Drake, Paige Shorten, Brooke Osborne, Kyla Love, Natasha Snelling & Chelsea Garrett. subs - Ellie Bird, Emily Moerkerk, Ellen Swift & Kayti Simonson. 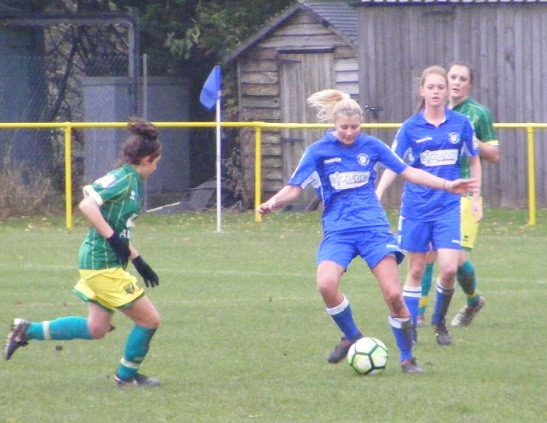 Lowestoft Town Ladies starting XI - Eilish Brogan, Lindsey Adams, Charnelle Riggall, Abbie Everson, Ellie Froud, Broghan Scully, Cassie Craddock, Gemma Moore, Aimee Durrant, Molly Hall & Hannah Waters (C). 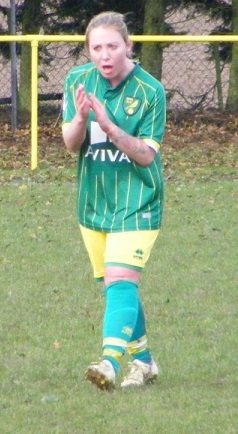 subs - Millie Cursons & Nina Batchelor. A switch of ends at the start the breeze picking up blowing from one goalmouth to the other across the pitch Lowestoft having it at their backs 1st half with Norwich kicking off wearing green shirts and socks with yellow shorts, Lowestoft kitted out in an all blue kit, both going to have a lot of brown added during the match it's muddy out there pity the kit washers. The ball is out of play straight away for a throw on the left. Lowestoft are awarded a free-kick jut inside their own half is played long with Molly Hall peeling into space on the right looking to get in behind, can't catch the ball before it runs out of play, from the goal-kick Aimee Durrant wins the ball for Lowestoft coming inside passes the ball out to Hannah Waters Lowestoft's captain drifting away to the right squares the ball back in along the top of the box is cleared by Bryony Rapley for Norwich before Durrant can run onto it. 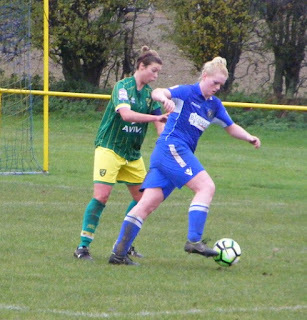 A god start from Lowestoft pressuring Norwich at the back for the ball, Gemma Moore on the left wins her side the 1st corner of the game takes it, lifting the ball into the six yard box Waters jumping near post can't reach the ball. A counter attack from Norwich the ball played forwards to Natasha Snelling on the left drills a diagonal ball into the area, is cleared by Lowestoft's Lindsey Adams spinning out into the middle Paige Shorten racing onto the ball goes to hit a shot a bobble sees her slice it horribly wide, turns into a good ball for Erin Wilson the Norwich right back getting forwards lifts a cross up into the area Lowestoft head clear. Is wet and muddy out there going to ground to make a challenge is risky, Norwich's Rebecca Russell is late with her tackle catches Waters as she tries to bring the ball forwards on the right bringing her to the ground a painful one but Waters is okay. Russell gets yellow carded. The ball is played up into the area the header won by Norwich is knocked into the ground, the home side struggling to clear their lines the ball rebounds to Moore 20 yards out left of the D fires a low shot in through the crowd, Norwich goalkeeper Fiona Coombes dives to her right pushes the ball wide for a corner. The ball goes long towards the far post the ball is headed down Durrant 3 yards out, cleared off the line by Norwich for a 2nd corner. Hall moves towards the ball this time can't direct her header on target comes back to Moore who plays her cross into the side netting. Has a derby feel about it the slippery conditions meaning the challenges aren't well timed or controlled to make matters worse a light rain has started to fall blowing across the pitch. 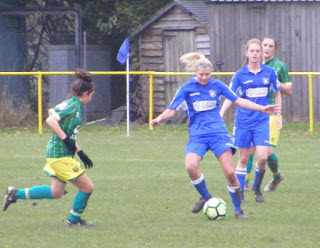 Shorten with a good pass forwards looks to play Chelsea Garrett in behind, Lowestoft's Ellie Froud with a good tackle to get her foot on the ball prevents the striker getting a run at goal. The ball out for a throw on the left is played inside rolled into Shorten's path goes for the long distance pile driver again the spin on the shot seeing it run away from goal. 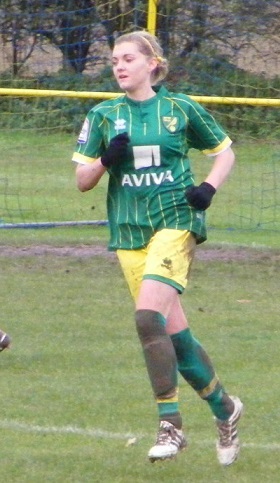 Norwich win the ball at the back, Kyla Love back to support her defence has the ball inside her own half takes it down the right, a storming run carrying it 3 quarters the length of the pitch evading two challenges squares the ball into the area looking to pick out Garrett near post as she arrives in the box, the ball is taken off her toes by Lowestoft's Lindsey Adams getting across from left back to defend. Norwich pressuring the ball is deflected into the middle for Shorten gets the pass in behind for Garrett coming in from the left, Brogan commits early sliding in the pair collide inside the box and Garrett squeezes a shot past her runs wide across goal, both striker and keeper are okay to continue. Both come together in a similar incident moments later this time Garrett is flagged offside moving into the box from the right. Broghan Scully gets her foot on the ball in the middle for Lowestoft passes the ball into Hall 25 yards out right of goal, goes to shot Norwich captain Kate Parson's charging the shot down as the rain starts to fall heavily. Durrant carries the ball on up the left side, skipping past a lunging challenge gets into the box pulls the trigger aiming near post Coombes has the angle covered parries the ball down and catches safely. 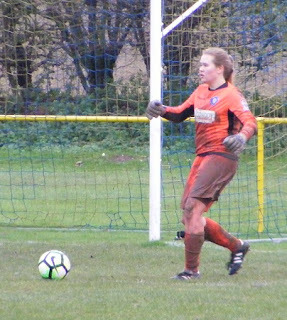 On the opposite flank Waters is played in behind coming in from the right shoots from just outside the box, Coombes across to cover her near post gloves the ball down and saves. Moore with a long range shot sends the ball over the crossbar for Lowestoft from 30 yards out. The rain is getting heavier the wind picking up. Lowestoft are pushing hard as the 1st half moves towards the last 10 minutes, Durrant with the ball on the left rolls it on into the box for Moore to go after, Wilson gets her foot on the ball conceded the corner. Bizarrely just as the rain and wind has been at it's worst it quickly fades as Norwich attack from the restart the ball sent long to Snelling on the right whips an early ball into the Lowestoft area bounces through to the far post, Love free that side coming in can't get near it as it runs out of play. Brooke Osborne puts pressure on the Lowestoft defence wins her side a corner on the right. Brogan coming for the ball near post misses it but so does everyone else as it flashes across the six yard box. Lowestoft's Molly Hall, holds off Norwich's Kate Parsons before shooting wide. A 1-0 advantage for Lowestoft as the sides head into the dressing room for half-time have dealt with the difficult playing conditions better than Norwich in the 1st half creating more chances and getting into the lead. Thankfully those conditions have dried up the wind dying down the rain stopping even a peek from the blue sky above the black clouds above. Came Lowestoft hold onto their lead 2nd half or will Norwich step it up get back on level terms it's Lowestoft to get the 2nd half underway. GOAL! The positive attacking start to the 2nd half from Norwich tells as they get themselves back on level terms 10 minutes played the ball is lifted up into the area shots are blocked at the top of the area central Lowestoft battling to get the ball away. Pinging around a rebound takes it out of the box 25 yards out Shorten's eyes light up she isn't afraid to have a shot from distance two wayward attempts in the 1st half this is anything but, a belter of a strike nothing Brogan can do as it flies past her into the back of the net beyond 1-1. 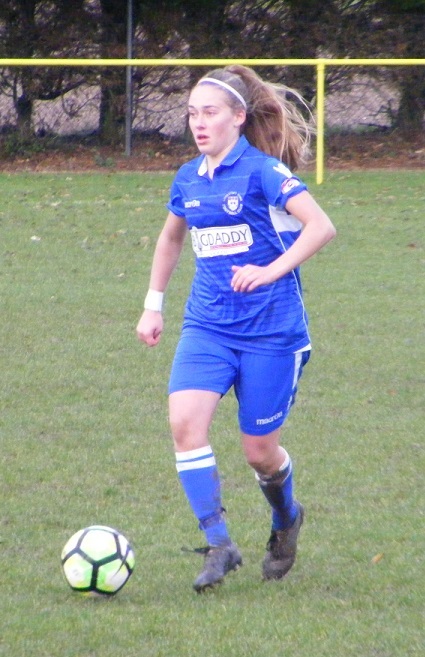 Lowestoft make the 1st substitution of the game bringing on Nina Batchelor for Scully in midfield. Brogan is at it again for Lowestoft in goal making another instinctive save as Norwich are awarded a free-kick wide on the right, Shorten playing the ball long towards the far post, Parson's jumping heads the ball down from close range, straight at Brogan the goalkeeper saves pushing the ball up over the bar to land on the roof of the net. GOAL! Norwich's lead is short-lived as Lowestoft score from a corner for the 2nd time in the match, Moore to take it from the left another good delivery an inswinging ball flies across the six yard box looks to come back off the far post into the middle of goal, players from both sides converge on the ball, it is stabbed over the goal line Lowestoft running out of the area celebrating, Abbie Everson with the final touch is credited with the goal 2-2. Lowestoft kick-off the 2nd period of extra-time 15 minutes for either side to find a winning goal or it'll be settled by penalties. Lowestoft go long to the right for Durrant from kick-off, trying to get down the line is tackled well by Russell. The ball goes long up field for Drake 25 yards out turns playing the ball into the path of Shorten making a forwards run to get into the area left side of the D, Brogan comes rushing out goes to ground, Shorten gets the ball past the keeper runs wide across goal beyond. Might have mentioned I hate penalties before but that's the way it is been an enthralling contest by both sides contrasting halves both could have won it, fair to say neither deserve to loose it but we have to have a winner. Norwich to take the opening penalty it's their captain Parsons to take it cool as you like sends the ball to the keepers left into the back of the net 1-0. Shorten up next to take Norwich's 2nd penalty saw her strike saved by Brogan in the 2nd half diving to her right, Brogan does the same, Shorten doesn't putting the ball low to her left to score 2-0. Lowestoft captain Waters up next to take the visitors 2nd penalty powers the spot kick high to the keepers right, Coombes diving gets a glove to the ball but can't keep it out 2-1. Ellen Swift with Norwich's 3rd penalty kick hits it low and accurate into the bottom right corner to score 3-1. Rapley to take Norwich's 4th spot kick goes for height again only this time the ball flies over the bar the score remains 3-2. Moore comes forwards to take Lowestoft's 4th penalty with a chance to level things up coolly slots the ball down the middle sending Coombes the wrong way. 3-3. Craddock up last to take the 5th Lowestoft penalty scores and it goes to sudden death runs up goes for power and height the ball smashing off the crossbar heartbreak! Norwich rush from halfway in celebration however the referees assistant is waving his flag furiously, the officials consult did Coombes move off her line too early, Parsons goes over to them but the celebration can continue Norwich win the penalty shoot-out 4-3 to advance into the 1st Round Proper of the FA Women's Cup. A fantastic game for the neutral had it all rather not see a penalty shoot-out but there you go credit to both sides played some great stuff on a difficult surface and rubbish weather. The result both will agree could have gone either way. Norwich will now be at home in two weeks time playing AFC Wimbledon Ladies for a place in the 2nd Round Proper of the FA Women's Cup.